Nearly half of the Democrats who will serve in the House next year signed on to support state Rep. Dennis Bonnen's speaker bid. Other members are left wondering what a House with Bonnen at the helm could mean for them — and whether they could get behind it. State Rep. Dennis Bonnen, R-Angleton, announces at a Capitol press conference that he's accumulated enough votes to be elected speaker of the Texas House in January. Bob Daemmrich/BDP Inc.
Democrats in the Texas House were feeling good in the days after this year’s election. They had just picked up 12 seats in the lower chamber, chipping away at the GOP’s massive majority. And the caucus chair, state Rep. Chris Turner, D-Grand Prairie, was working to organize members in hopes of swaying the race to become the next House speaker. But less than a week after Election Day, the speaker’s race ended before Democrats could find a candidate to coalesce behind. One by one, those in the race to replace the retiring Republican Joe Straus had dropped out. And state Rep. Dennis Bonnen, R-Angleton, announced that 109 out of 150 members had pledged to support his bid for the gavel. Seventy-eight of those were Republicans, meaning Bonnen had a majority of members' votes without even accounting for Democrats. That was a hard pill for many Democrats to swallow since they had voted as a group to help bring Straus, a moderate Republican, to power and keep him there. Though the Democrats had gained seats this year, they might also be gaining a speaker who is less indebted to them — and who many believe is more conservative than Straus. Reactions have varied inside the caucus. Nearly half — 31 of 67 — of the Democrats who will serve in the House next year signed on to support Bonnen, a fiery lawmaker who has at separate times clashed with Democrats and conservatives in the Senate. Other members are left wondering what a House with Bonnen at the helm could mean for them — and whether they should get behind the idea. 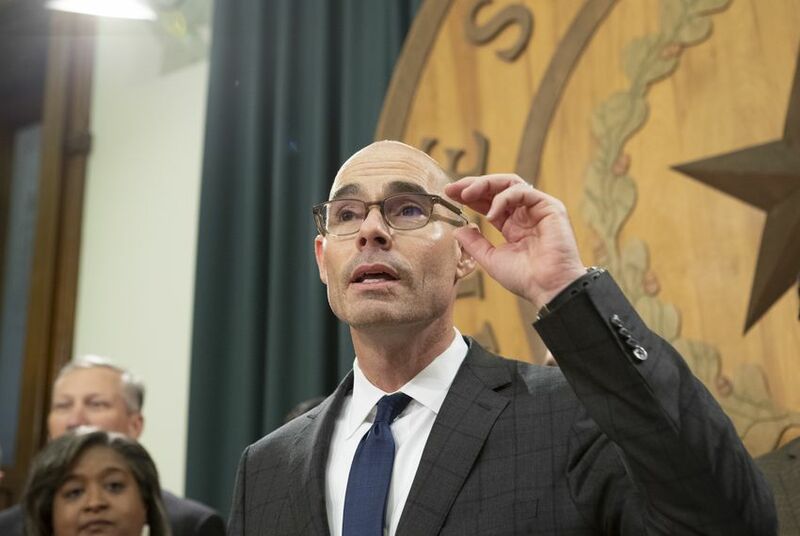 Bonnen, who has served in the Texas House for more than two decades and chairs the powerful tax-writing House Ways & Means Committee, has long been regarded as a hard-nosed lawmaker who doesn’t shy away from conflict. Many Democrats, in turn, have applauded him for continually standing up for the Texas House in its rivalry against the Senate — even if it put him at odds with Republican Lt. Gov. Dan Patrick, the hardline conservative who presides over the upper chamber. Other Democrats, meanwhile, are comforted by Bonnen’s close ties to Straus. During his time in the House, Bonnen served as a high-ranking lieutenant for the outgoing speaker and was three times appointed by him to be House speaker pro tempore. Bonnen “understands that the speaker's job is to unify, move agendas and to let the House work its will,” said state Rep. Garnet Coleman of Houston, who was also on Bonnen’s initial list of supporters. But behind the scenes, some Democrats recounted instances that left them worried about a Bonnen speakership. Some cited an incident at a committee hearing in 2014, when Bonnen used the word “coonass” while discussing children coming to Texas in the aftermath of Hurricane Katrina. That derogatory term for Cajuns was formally condemned by the Louisiana Legislature in 1981 and Bonnen, at the time, faced backlash from both Texans and Louisianans. He apologized for using the slur. Democrats have also raised some worries about Bonnen’s legislative record, noting that he’s pushed some conservative measures that they strongly oppose. In 2017, Bonnen, like every other Republican speaker candidate, signed on as a co-author to a contentious “bathroom bill” that would have restricted the use of certain public facilities for transgender Texans. The bill never became law. Some members of the minority party are also wary of Bonnen for his vote in favor of a highly controversial amendment to the 2017 “sanctuary cities” bill. The amendment, derided by Democrats as the "show me your papers" provision, allows police officers to ask about the immigration status of anyone they arrest or detain, including in traffic stops. “I was not on the list [of Bonnen’s pledges] to honor the concerns of a large percentage of Mexican-American Legislative Caucus members about the anti-Hispanic tone of recent sessions,” said state Rep. Rafael Anchia, D-Dallas. Bonnen didn't return requests for comment for this story. But even with those reservations, 31 Democrats have publicly expressed support for Bonnen as speaker. And some of those not on the list insist their reluctance isn't personal. Turner, the caucus chair, said he looks forward to having “productive conversations” with Bonnen in the coming weeks. Others, like state Rep. Celia Israel of Austin, said she has a meeting with Bonnen scheduled. She said her name wasn’t on his preliminary list, in part, because she signed a promise saying she’d vote as a group with the Democrats. She also admitted that, unlike some Texas House veterans, she doesn’t know Bonnen well. But whether their names were on Bonnen’s initial list of supporters or not, Democrats said they were heartened by Bonnen’s comments during a press conference announcing that he had the votes to become speaker. When asked what his top priority would be next year, he raised an issue that was also at the top of many Democrats’ lists — school finance. “I believe that Dennis has laid out a good unifying policy issue that marked the end of Straus’ leadership, so I’m optimistic we can do good things,” Coleman said. Bonnen also quashed rumors last week that there would be no Democratic committee chairs under his leadership. And more recently, he met with mayors of several of Texas' largest cities to discuss legislative priorities for next session and introduced a bipartisan working group to help identify candidates for the next House parliamentarian. Bonnen’s list of supporters is expected to increase in the weeks preceding the 2019 legislative session. Even the Democrats who kept their names off his initial list of supporters suggested that, in time, they might be ready to embrace Bonnen. “I’m prepared to meet him and talk with him about the future,” Israel said.